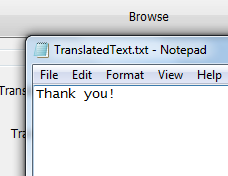 Translate !t translates Image/Text containing English, German, French & Spanish to many different languages using Bing Translator. 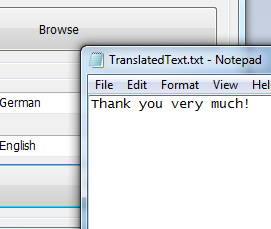 Translate !t uses Tessnet for character recognition and Bing Translator for translating text. Recognizing text from an image is a difficult task. Please make sure your image is clear and has a white background for best performance. What is Remind Me About? Remind_me_about is a Twitter bot developed using php. *Follow Remind_me_about and wait for the bot to follow you back. RemindMeAbout will remind you on the date specified by you. Yes! When you want to add a reminder, simply send a Direct Message in any of the following formats. If your message format is not correct. RemindMeAbout will notify you. Jata is a Google Talk like Twitter Application which was developed using VB.net and Twiteroo Twitter API framework. jata automatically checks for new messages periodically. You can post your status right from jata post message screen. You can also reply to tweets using jata. Build View is a Visual Studio 2008 Add In which will show the progress of the build using the new Windows 7 progressbar. Unfortunately Visual Studio does not have an option to retrieve the progress of the build. Build View chooses the most approximate build time based on previous builds of the project and then shows the progressbar. Which means after 2/3 builds, progress bar will start displaying the animation effectively. 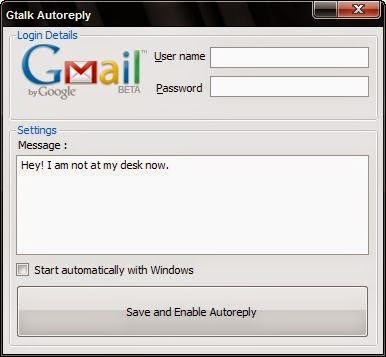 Gtalk Autoreply is a windows utility to set an auto reply for Google Talk. A little open source .net application to turn off your laptop/computer monitor by double clicking a Notify Icon.